FARMHOUSE, COPPER TOP DINING TABLE: Rectangle Copper Top Table — 96″L x 44″W x 2H” — mounted on Farmhouse Wood Table Base. Compliments Country Italian, Ranch or Southwestern decors. 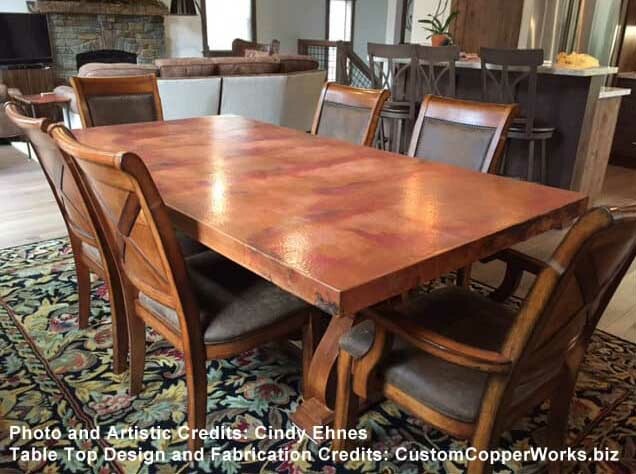 FARMHOUSE, COPPER TOP DINING TABLE: Rectangle Copper Top Table — 96″L x 44″W x 2H” — mounted on Farmhouse Wood Table Base. This timeless copper dining table design allows for good legroom and compliments Country Italian, Ranch or Southwestern decors. It works well as a kitchen table in a smaller size, or dining room table in a larger size. Can be ordered with or without the carved corner insets. Many people who order this design include one or two matching benches. Pricing: Complete the Quote Form at the bottom of this page for today’s current price quote. FARMHOUSE, COPPER TOP DINING TABLE: Rectangle Copper Top Table — 96″L x 44″W x 2H” with 2″ side drop — mounted on Farmhouse Wood Table Base. Size: 96" X 44" X 2"
Color: 3W stain, finished with matte polyurethane to deepen color and protect against stratching. Like it but want Customization? We customize to your design specifications. This table is available is all sizes. Check out your other design possibilities. GET STARTED! Below are photo approval photos for Frank’s copper table top and traditional/modern, wood table base. Click on image to view larger image. We will call you with a price quote. We do not inventory. Our work is made-to-order to your specifications. Allow 8-12 weeks for delivery. Expedited order service is available. Call the office for details. Design elements from different copper top table designs can be combined and modified to create YOUR unique copper top table design. Keep in mind that most table bases can be modified for square, round, rectangle or oval.